Cliffs of Moher. 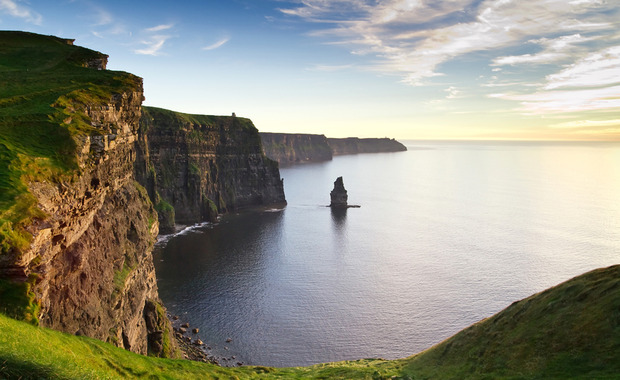 Ireland capped off 2014 with two major tourism accolades in the US. Alison Metcalfe, Tourism Ireland’s head of North America, accepting the “Best Destination: Europe” award for Ireland, at the Travel Weekly Readers Choice Awards in New York. Two major accolades have capped a remarkable year for Irish tourism. This week, Ireland was named 'Best destination: Europe” at the Travel Weekly annual Readers Choice Awards in New York. Ireland beat off stiff competition from England, France, Italy, Germany and Spain to take the award from the leading weekly newspaper for American travel agents and travel professionals. For the third year running, Ireland has also been named 'Best Tourism Destination' at the 2014 GT Tested Awards, voted for by frequent travellers in the United States. The awards ceremony took place in LA, where the favourite destinations, airlines and other travel-related products of luxury and business travellers were revealed. Global Traveler has a circulation of almost 110,000. Recently, Ireland was listed among Lonely Planet's Top 10 countries to visit for 2015, and Dublin has been the subject of three glowing travel features in The New York Times. “Travellers nowadays have tremendous choice, which makes it more important than ever for us to ensure the island of Ireland stands out from other destinations – so these awards are really good news, coming at the end of a record year for Irish tourism from the US." Tourism Ireland recently revealed its marketing plans for 2015, during which it hopes to attract a record 7.74 million visitors. By the end of 2014, it expects to have welcomed 1.2 million US visitors to Ireland, contributing over US$1 billion to the economy.